Home of a staggering amount of history, Ephesus once held the Temple of Artemis, one of the Seven Wonders of the Ancient World. This venerable site was also an important center of early Christendom: among seven cities addressed in the Book of Revelations, some suggest that the Gospel of John may have been written within its walls. The tour guide was knowledgeable, and very pro-turkey and informative. Not too hot; not too far to go. Speechless. An amazing experience. Do not miss. It was the highlight tour, so many packages were offered a bit confusing. Ephesus is incredible. The tour was well worth it as it is very rich in history, plus transportation there is not simple. You could spend a week there and not appreciate it all. Very impressive, but it needs a lot more excavation. Beautiful. Very slow paced, lots of time for photos and exploring. We did the Ancient Ephesus excursion which allowed us to get off the ship first and hop on a bus. This is an excursion not to miss. This is an excursion not to miss. The ruins of Ephesus are amazing and beautiful!!! Good tour but they slipped in a visit to a rug coop or so called, but we bailed out with excuse that we had to get back to the ship for medicine. Ephesus is truly amazing - the most impressive ruins you will ever see!! This tour provided only distant views of Ephesus, not actual entry into the site. This tour provided only distant views of Ephesus, not actual entry into the site. The guide did take us to a Muslim mosque in another village. This was a good experience. We used Best of Ephesus Tours by Locals and had Zeynep Elitemiz as our tour guide. It was very well done. The tour leader was very knowledgable and she kept us together. Ephesus -- think the Book of Ephesians -- was where Paul walked the same streets and sat at the same stadium and visited the same gymnasiums. Extremely difficult walking tour but worth the pain killers we had to take when we got back to ship. 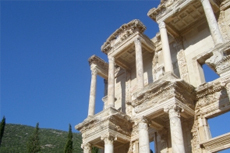 Tour - Ephesus Shuttle - Curio Travel Turkey & Greece. Our tour guide Aysenur was excellent. Ephesus and the House of the Virgin Mary were wonderful. Very hot day, lots of walking and uneven ground so wear comfy shoes. Walking tour of ancient Ephesus; rug making demonstration; browsing of harbor shops. Walking tour of ancient Ephesus; rug making demonstration; browsing of harbor shops. Rug-making demo too high pressure to buy a rug. Fantastic guide who took us to the House of the Virgin Mary and the Church of St. Fantastic guide who took us to the House of the Virgin Mary and the Church of St. John. I also thoroughly enjoyed the carpet shop but I was looking to buy and did buy a carpet.